Family Sharing allows up to 6 people in your family to share each other's iTunes, iBooks and App Store purchases without sharing accounts. Pay for family purchases with the same credit card. For assistance setting up Family Sharing, refer to Set Up Family Sharing. 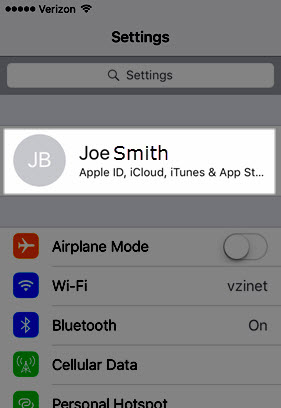 For info on Family Sharing and Kids, refer to Family Sharing and Apple IDs for Kids. Family Sharing requires software version iOS 8 or higher. To determine Device Software Version, refer to View Software Version. Tap your Apple profile (along the top).